Frankel would have been the best horse to run at Saratoga today if NYRA had renewed its simulcasts of British racing. Officials are not to blame. Only a dozen or so fans used to show up to watch and wager on the morning telecasts at the Post. Even bubble and squeak couldn’t entice them. The undefeated Juddmonte star will have run in the Qipco Sussex Stakes at Glorious Goodwood before most people read this Diary. One day, he’ll lose – it’s inevitable. But, boy, it’s been fun to follow him. In contrast, the Wednesday afternoon card of live racing at Union and East is again below grade. Below grade may be a harsh assessment. It’s the grade that’s not what it should be. For a small stretch of history, Saratoga produced competition of extremely high quality. If there was the rare claiming race, it was for $80,000 claimers. Practicality today requires several races daily for horses worth $20,000. Nevertheless, NYRA officials contend business is good. Handle and attendance figures are moving along at a clip that’s ahead of last year. Monday’s crowd was about 1700 people shy of expectations. Given Sunday’s weak on-track betting from an announced crowd of 50,727 – mostly fans who were there for the baseball cap giveaway – there may be a trend line that’s not very encouraging emerging. Entries will be drawn for Saturday’s Whitney Handicap this morning at 11:00 am and the news coming out of that paddock event should restore faith that the Spa is not Finger Lakes. 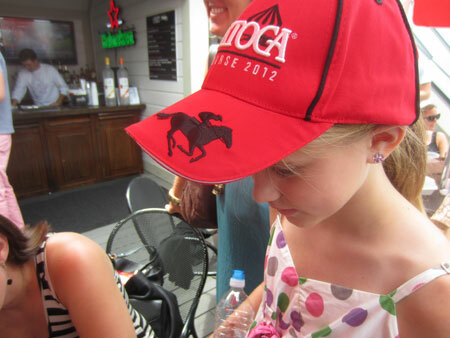 Grace Kaseman of Lincoln, NE was one of many who came to Saratoga Racecourse for a ball cap. Tuesday passed without anything exceptional occurring. The dark day was unlike a previous day, when a prominent horseman, visiting the backstretch on bicycle, noticed his tires were running low. He spotted an air hose and began filling the tires with air, until a NYRA security guard stopped him. “You can’t use that air,” a security guard warned. “That’s NYRA air,” he explained. It was a splendid day, sunny and warm, with less humidity than last week. 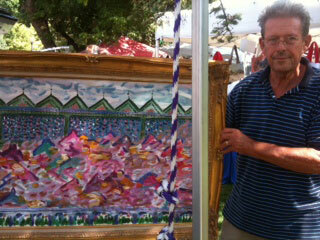 Campion Leczinsky, a self-taught artist, participated in the Crafts Fair at the Carousel in Congress Park. There is nothing correct about his affordable, primitive art paintings of jockeys and baseball players – not the perspective, nor the scale, nor the brush strokes. But they sure make you smile. Campion Leczinsky displays one of his primitive art paintings. The Pulitzer Prize-winning author of Legs and Ironwood, William Kennedy, will speak about the Prohibition Era in Saratoga Springs at the Canfield Casino tonight. His topic is criminal life. 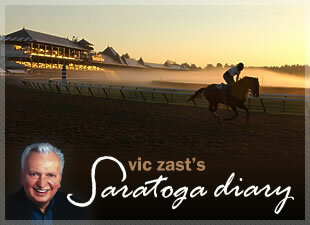 Saratoga’s number one fan, Charlie Zast, turns 4 today.